You know your blog could be better than it currently is. Shareaholic can help. For only $49, you can have this streamlined and professional theme from PixelUnion. It’s flexible for both text and visual content, and you can customize the colors to fit with your brand. It also has built-in social sharing buttons and comment systems to make it easy for you to have dialogue about your content. If you have a ton of visual content that you want to showcase, theflow 2.0 is for you. One of its best features is that it will let you directly share the photo by mousing over it on the homepage. Try out theflow 2.0 for yourself. Another one by PixelUnion, this Tumblr theme is grid based. Use this theme if you’re trying to get that minimalist Pinterest feel with social sharing and commenting systems built in already. By looking at the theme from PixelUnion, it’s no surprise that it focuses heavily on images. I love the browsing functionality on this theme–it’s great for photographers, graphic designers or any portfolio with visual elements. If you are a business, you need to make sure your site is optimized for mobile–you never know how your customers will try to access your site. Origin West is a two-column theme that is responsive, meaning it is automatically compatible with mobile devices. It’s also pretty slick and integrated with social sharing networks. 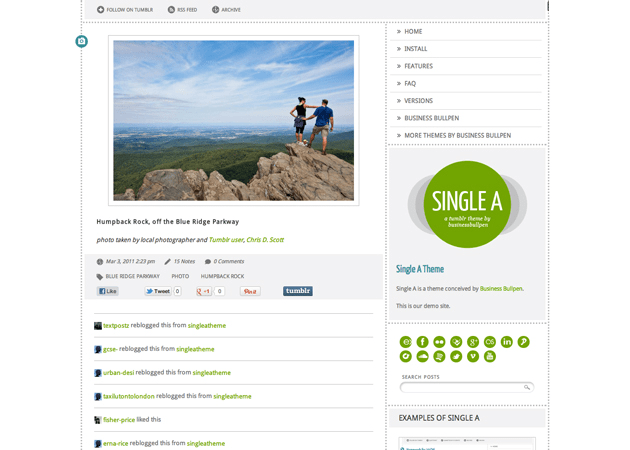 If you’re looking for a two-column theme for both text and picture posts, then Single A is a great option for you. Beyond its gorgeous layout, it’s also free–a great bargain for a new startup or small business. This theme is perfect if you’re looking to have pops of color on your page. With fully customizable colors, you can make sure your blog is on-brand and eye catching to new visitors. This theme is one of the most customizable themes available. Pick the column width, color palette, and images available to make this theme your own. This is a great option for those businesses looking to have near-complete control over their theme. Like the title says, this Tumblr theme is awesome at showcasing portfolios. Whether you’re a hot-shot agency looking to woo top clients with your creative work or a freelance artist trying to land your next gig, this theme has a gorgeous and minimalistic style to let your content shine. This theme is perfect if you like minimalist yet funky layouts. It’s also primed for social sharing with built in social media buttons, which is essential to getting more eyeballs on your gorgeous website. What are your favorite Tumblr themes for your business? Share your thoughts with us below.